Learn more about Horan Estates Winery and the family history. In the year 2000, Doug McDougall planted an organic apple orchard on the south slope of the Frenchman Hills not far from Royal City, Washington. At the same time, he lined out about 2 acres of Syrah wine grapes on land near his orchard on Frenchman Hills, just to see how they would turn out. The first vintage was produced in 2002, and Doug sold the small amount of grapes to a well known winemaker from the Tri-Cities area. When the winemaker praised the high quality of the grapes he had received, Doug, along with his wife Diana and dear friends Ross and Kelly Riedinger, decided to start a small winery in Wenatchee Heights, beginning with the 2003 crop. They named the winery Horan Estates, paying tribute to Doug’s mother’s side of the family, who had historical ties to the Wenatchee Valley since the late 1800’s. 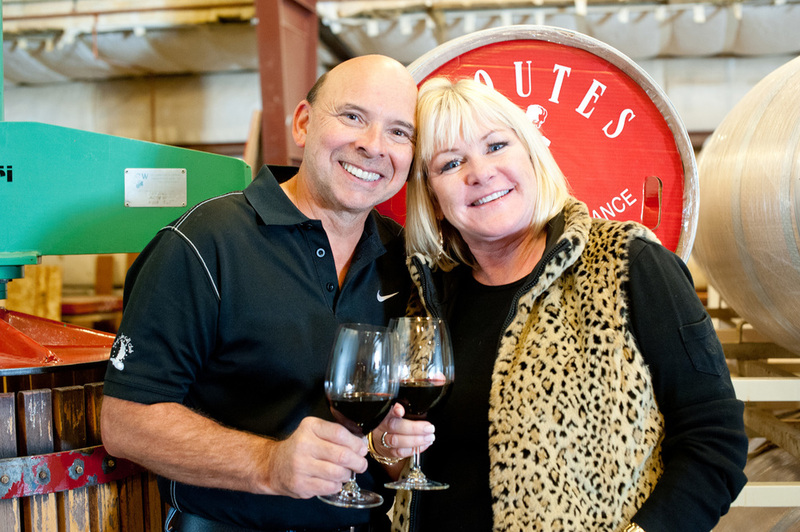 In the fall of 2010, Doug's cousin, Beth Dobbs, joined with the McDougalls to help with the marketing of Horan Estates award winning wines to local wine shops and restaurants. The 2003 and 2004 vintages were composed of grapes from the Frenchman Hills vineyard and another vineyard in Mattawa, Washington that Doug had planted on orchard property he co-owned and managed for other owners. From 2001 until 2004, Doug planted additional acreage at the Frenchman Hills site, now known as the Westhill Vineyard. Due to the quality of the grapes produced here, this vineyard has been the sole source of grapes vinified by Horan Estates Winery since 2006. The 8 acre vineyard is planted to Syrah (the dominant variety), Cabernet Sauvignon, Merlot, Cabernet Franc, and Viognier. Since producing its first vintage in 2003, Horan Estates Winery has concentrated on the crafting of three red wines. The first is CWM Syrah, named after the McDougall’s only son, Corey Wayne McDougall, who passed away in December, 2003 after a tragic snowmobiling accident. The HVH Red Blend is dedicated to Doug’s grandmother, Helen VanDivort Horan, who passed peacefully in January, 2004 at the age of 100. The third is Cabernet Sauvignon, made from the five clones planted in the vineyard. The winery has branched out from its beginnings of being open only twice yearly, to having a tasting room in the McDougall’s garage in East Wenatchee, to currently occupying our new tasting room in the Mission District of Cashmere, Washington. In 2012 Doug & Diana handed the vineyard and winery on to their cousin Beth Dobbs and her husband Dennis, a Certified Sommelier. Together they have rebuilt the the tasting room and been working on revitalizing their wines for a new generation. With the Horan history strong in their hearts they are sharing their family stories with every new vintage of Horan Estates Wines. Please come and visit us year round, Thursday through Saturday, Noon - 5 pm Sunday & Monday, 11am - 3pm or by appointment. We are located at 207 Mission Avenue, Suite B, Cashmere Washington 98815. We can be reached by telephone at 509-679-0554. Come and taste our award winning wines. We look forward to seeing you soon!